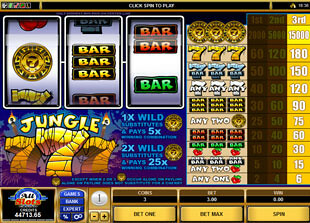 Jungle Sevens Slots is 3 reel, 1 payline video slot designed by Microgaming. This classic game has bright graphics and unusual theme thanks to which customary classic symbols seem to become “wild”. This game will perfectly suit taste of those who give preference to the straightforward game play. Just choose the maximum bet and you will get the chance to win top jackpot of 15,000 coins or $225,000. 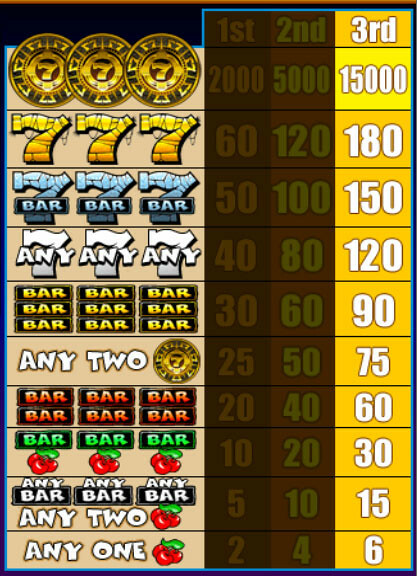 Jungle Sevens Slots has following symbols: Yellow Seven, Blue Seven, White Seven, Triple Bar, Double Bar and Single Bar. Special symbol of the game is Golden Coin. This game offers you various coin nominal to choose from: $0.25, $0.50, $1.00, $2.00, $5.00. You can stake up to 3 coins per line. The minimum bet represents $0.25, the maximum one is $15.00 per spin. The highest jungle jackpot is 15,000 coins or $225,000 for 3 Golden Coins, if you stake 3 coins per line. The second jungle jackpot is 5,000 coins or $75,000 for 3 Golden Coins, if you stake 2 coins per line. The third jungle jackpot is 2,000 coins or $30,000 for 3 Golden Coins, if you stake 1 coin per line. The wild symbol of the game is Golden Coin. It plays the particular role in the game because it can make the winning combination complete by substituting for lacking symbols. Moreover, your win will be multiplied by 5x, if there is one wild symbol in your winning combination. And your prize will be multiplied by 25x when two wilds are the part of winning combination. Jungle Sevens slot machine is fantastic game with jungle theme that made this classic slot to be brighter and more interesting to play, especially because of its top jackpot of $225,000.